ormer Vice President Al Gore, Jr. became a billionaire by fanning the social progressive fabrication that sweating men, flatulating cows and CO2 are responsible for global warming. To curb global warming according to Gore in his Nobel Prize winning "Inconvenient Truth," it's only necessary to curtail carbon dioxide emissions. The more you reduce carbon dioxide the more you reduce global warming. The problem is, as you reduce the amount of carbon dioxide in the atmosphere you also proportionately reduce the amount of oxygen in the atmosphere since carbon dioxide is the "food" green plants consume to produce oxygen through photosynthesis. Let's look at the cycle, because once you realize the impact of what you are reading, you will also realize that Al Gore, Jr. and his ilk are some of the most dangerous people on Earth. Because if they succeed in outlawing carbon dioxide, they will also outlaw God's nature from manufacturing both oxygen and water. And quite literally, the far left's environmental agenda to enrich themselves at your expense will kill you. The anti-fossil fuel "save the world" from people ecowackos have correctly gauged that one gallon of gasoline (which weighs about 6.3 lbs) produces about 20 lbs of CO2. They base that on the fact that when gasoline burns carbon and hydrogen atoms separate. Hydrogen then combines with oxygen to become water and the carbon atoms combine with oxygen to become carbon dioxide. To calculate the amount of CO2 produced from a gallon of gas, the weight of the carbon atom (12) is added to the weight of two oxygen atoms (32) for a total weight of 44/12 or 3.7. Since gasoline is about 87% carbon and 13% hydrogen by weight, if we multiple the weight of carbon (5.5 lbs) by 3.7 we have about 20 lbs of CO2. Okay, now that I fed you the boring stuff, here's the interesting stuff. A single mature tree absorbs carbon dioxide at a rate of about 48 lbs per year, and releases enough oxygen back into the atmosphere to support two human beings. One acre of trees annually consumes about the same amount of carbon dioxide produced by driving a car 26,000 miles. That same acre produces enough oxygen to keep 18 people alive for a year. A normal yard foliage tree consumes about 48 lbs of carbon dioxide and produces a minimum of 260 pounds of oxygen. Two such trees will support a family of four. A 100' tree with an 18" diameter at its base produces about 6,000 pounds of oxygen per year as it consumes 8,251,875 lbs of carbon dioxide. Do you have the picture now? Good. Now, here's the question. What would happen if the environmentalists were able to convince the US Supreme Court to allow the Environmental Protection Agency to regulate carbon dioxide, and give them the power to dramatically reduce the amount of carbon dioxide that is released into the atmosphere? Oops. The Obama Administration has already done that. On June 21, 2011 the Supreme Court, in an 8-0 vote in American Electric Power Co. v Connecticut, ruled that the federal Clean Air Act gives the sole authority to regulate greenhouse gas emissions (i.e., CO2 emissions) to the EPA (Justice Sonia Sotomayor did not vote since it was her decision in the 2nd Circuit Court that was being appealed. Connecticut vs American Electric [a party to an action joined by New York, California, Iowa, New Jersey, Rhode Island, Vermont and Wisconsin sued America Electric, Southern Electric Company, Cinergy, Xcel Energy and the Tennessee Valley Authority). Connecticut sued to force American Electric to curb the amount of CO2 its power plants emitted. American Electric argued that under the "political question doctrine," the judiciary had no right to hear the action. The US District Court agreed. On appeal to the 2nd Circuit, Sotomayor reversed the lower court, because in her world, "law is made at the appellate level." The 2nd Circuit argued that the political question doctrine did not apply, and the federal courts did have jurisdiction. The Supreme Court overturned the appellate court and upheld the 2004 US District Court decision. The unfettered control of carbon dioxide emissions was important to a whole host of Watermelons (leftists who are green on the outside and communist red in the inside) who got together and dreamed up Cap & TradeThe American Clean Energy and Security Act of 2009, the Waxman-Markey Bill (passed by the Obama Democratic super majoritya scheme to make all of them billionaires at the expense of the taxpayers in every nation on Earth who will be obligated to pay exorbitant carbon taxes for being the root cause of global warmingjust for being alive and for consuming fossil fuels to power their cars and light their homes. The Waxman-Markey Bill became the guideline of the draft of an international treaty to cap carbon emissions in the industrialized nations while providing flexibility in the emerging nations, letting the industrialized nations buy "carbon credits" from undeveloped nations who are not yet developed enough to use their allocation of carbon emissions credits. While conservatives viewed the Supreme Court decision as a victory, the Watermelons who are trying to force the use of what they call "Earth Renewables"also viewed it as a victory since, as long as the Watermelons controlled the legal limits of carbon dioxide in the United States and the other industrialized nations, they could legally reduce the legal limits of carbon emissions by virtually banning the use of carbon fuels to such a degree that the industrialized world would be forced to use ultra-expensive and sadly inefficient wind and solar power as the third world, where the princes of industry had transferred the world's technology, could safely spew tons of toxins into the heavens while also buying and selling selling carbon credits to the industrialists in the now impoverished industrialized world. Note: as you read this, remember why it is that we need carbon dioxide emissions. And, remember this as well: windmills and solar panels don't replenish the carbon dioxide we need to create oxygen. Nor do they create enough real electrical power to adequately replace carbon fuel generated electrical power, either; but that's not the point. The point is that the Watermelons are advocates of reducing man's greenhouse gas footprints because they stand to make obscene profits buying and selling carbon credits in the make believe parallel world of saving the planet by reducing carbon emissions when in reality, we are slowly killing the planet by dramatically reducing the levels of oxygen in the atmosphere, and expanding the world's deserts by greatly reducing the amount of rainfall that will reduce the amount of arable land in the worldand the amount of water there is to drink. Whew. That was a mouthful. Particularly if you hold your breathe while you talk. That would be hard to do if you don't have enough oxygen to breathe when you start talking. Think of this as the latest reality game fad: a Monopoly-type reality board game called Climate Change where the players win by getting the most carbon credits, and by reducing the carbon footprints of their opponents as their land dries up and the opponents die of thirst, starvation or from being oxygen-deprived. Our reality, if this insanity is allowed to prevail, is that the areas around every major urban center in every nation on Earth will slowly become a dustbowl. Oxygen and water will have to be artificially produced in carbon dioxide factories and pumped into what will then become controlled human environments. Large numbers of humans will attempt to survive in wastelands devoid of grass and water, struggling to breathe an atmosphere with lessened amounts of oxygen. Denied access to water, food and oxygen-rich air, millions will die. The environmentalists will get their wishthe world's population will shrink to what the Watermelons believe is a sustainable level. You never heard much about global warming until Bill and Hillary Clinton won the White House and Vice President Al Gore, Jr., who became the unofficial Climate Czar of the world, created a parallel universe in Earth In The Balance in which people were responsible for global warming because they drive gasoline-powered cars and demand increased amounts of electricity for their "comforts of life" generated in electrical power plants fueled by oil, natural gas or coal. Gore wrote the politically-correct script on global warming as he ran against Michael Dukakis [D-MA] for the presidential nomination in 1988Earth In the Balance. Gore republished Earth In the Balance in 1992 when he ran against Clinton. Clinton, who saw the issue of global warming as a distraction and not an issue that would drive future elections, gave the issue to Gore to do with it what he pleased. It pleased Gore to create a environmental monster. In Gore's parallel universe, global warming is caused by too many people. 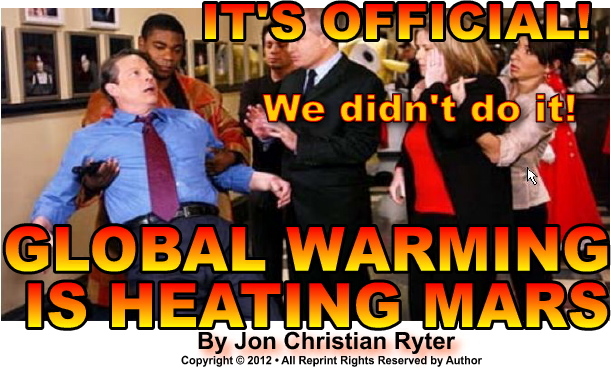 Gore fanned the fires of global warming from 1993 until 1997. It was now the major political issue on Earth, with the UN pushing it. Gore's Undersecretary of State for Global Affairs, former Sen. Timothy Wirth [D-CO] wrote most of the language of the Kyoto Protocolthe international agreement to the UN Framework Convention on Climate Change (formerly known as the UN Framework Convention on Global Warming) to ban greenhouse gas emissions. Again, in case you forgot, greenhouse gases are those carbon dioxide emissions that are needed to create the air you breathe and the water you drink and, by extension, the food you eat. In other words, it's kinda important to the survival of mankind. The Kyoto Protocol was adopted in Kyoto, Japan on Dec. 11, 1997 and it officially went into affect on Feb. 16, 2005 even though the US Senate sent a 99-0 resolution to President Bill Clinton advising him not to sign the Kyoto Protocol since the Senate was going to reject it. While still in Kyoto, Japan, Gore "ceremonially" signed the Protocol just as Obama Secretary of State Hillary Clinton ceremonially signed the UN Small Arms Treaty that bans the sale and distribution of small arms to private individuals anywhere. Fast & Furious, the DOJ, FBI and ATF "gun investigation" in how the drug cartels get their weapons is now unwinding and, as it does, it appears more and more like it was orchestrated by the Obama Administration to force the US Senate to ratify the UN Small Arms Treaty that would effectively outlaw the sale of small arms by anyone to anyone not in government in the United States, effectively erasing the 2nd Amendment from existence and criminalizing the private ownership of guns in the United Statesand blaming it on the UN. As an additional footnote, let me explain what the previous paragraph means. In Emer deVattel's 1773 The Law of Nations (the foundation and contemporary basis of common law in the world] deVattel notes that at the instant a treaty is signed it becomes binding on the signatory nationeven if the laws of that nation mandate that no treaty is binding until it is ratified by that nation's parliament or Congress. It is construed that if a Minister of that nation, or a Premier or Vice President signs the treaty in question, he is acting as an agent of the State, thus binding his nation to the agreement.) While the UN archives show that the United States has not yet ratified the Kyoto Protocol, the World Court, in a legal challenge, would likely construe that when Gore signed it, he obligated the United States to honor the accord. When treaties are signed, they affect the conduct of government in every signatory nation. For that reason, treaties are viewed in The Law of Nations as superior law that subordinates national laweven constitutional law. Concealing the fact that the United States has the world's largest known oil reserves became what could almost be called a fetish with the international princes of industry as they bought their oil from America's deadliest enemiesthe Muslim Mideast, China and the former Soviet Union, all of whom are openly using their trade surpluses with the United States to develop the nuclear arsenal they will need to annihilate us as the American people increase their demands on the governments the princes of industry control, to drill domestically and end America's reliance on foreign oil. The Seven Sisters are still hawking the John D. Rockefeller, Sr. myth that oil is a fossil fuel that does not self-replenish, the oil barons found a need to create a myth to justify a search for alternative fuels that cost more and don't work as wellcarbon fuels are bad because they generate the greenhouse gases that are overheating the planet. The oil barons have succeeded in selling the world on the notion that they need to be prepared to pay a lot more for energy and for transportation from fuel sources that are much more expensive and much less effective than carbon fuels. Why? To conserve the best, the most plentiful and most economical self-replenishing fuel source in the worldoil. But the environmentalists who were initially paid by the Seven Sisters to create ecological challenges that people would get behind to ban drilling for oil in America, discovered they could make more money selling the concept that carbon fuels were destroying the planet and there was a catastrophic need to remove man's carbon footprint from "Mother Earth" and save the planet from people rather than simply being the shill for Big Oil as they drove up the price of crude oil. That environmental message, Al Gore discovered, was not only easier to sell, but the Earl of environmentalism was able to leverage a Nobel Prize for his fabricated full length Academy Award winning DvD, An Inconvenient Truthwhich is an ecological fabrication from beginning to end. England's high court agreed and slapped an explicit disclaimer on the film in December, 2007. The verbal and visual disclaimer had to appear on the firm before it could be shown in any school in England. The disclaimer said that misleading exaggerations permeate the film. An Inconvenient Truth, the British high court said, contained too many factual errors for it to be shown in schools without a warning label. When Gore won the Nobel Prize for An Inconvenient Truth, the Nobel Prize Committee did something it never did beforeit announced the "first runner up" who would have been awarded the Prize had it not been given to Gore. They have never done that beforeor sincesuggesting the Nobel Prize Committee was pressured to present the award to someone they did not want to give it to. The Nobel Prize in 2007 should have gone to a 90-plus year old woman named Irena Sendler who personally rescued 2,500 infants from the hands of the SS and Gestapo in the Warsaw Ghetto between 1942 and 1943. She was caught on Oct. 20, 1943 and tortured at Piawiak Prison where the Gestapo used a wooden club to break all of her toes, then her feet, and then they began moving up her legs, breaking them again and again to get her to talk. When Sendler refused to talk, she was scheduled for execution by firing squad, She was rescued by the Jewish underground and hidden until the end of the war. But the Earls of Environmentalism thought Gore's fabrication was more important, and he won the Nobel Prize. Bowing to immense political pressure, the Nobel committee wanted to acknowledge Sendler. They did. In 2005, before An Inconvenient Truth, and long before the Nobel Committee was pressured into giving the former US vice president Irena Sendler's Nobel Prize, Habibullo Abdussamatov, head of the St. Petersburg, Russia Pulkovo Astronomical Observatory was the first to announce that global warming was not caused by humans since he had detected the current warming cycle on Earth was also affecting our neighbors, Venus and Mars. (I reported this in Plain Talk on Jan. 10, 2010 in the article, "The real cause of global warming: Solar Cycle 24." Abdussamatov pointed to data published by NASA that month that the space agency harvested from NASA's Global Surveyor and Odyssey. NASA recorded that the carbon dioxide "ice caps" near Mars' South Pole had been melting for three consecutive summers. They also noted that summer temperatures on Venus had risen from an average of 470° to 513°. Don't know what the scientists at NASA think, but I personally don't think the melting of the ice caps on Mars and the temperature hikes on Venus are caused by too many sweating people on Earth, or too many flatulent cows. And, regardless how good Gore and the Watermelons are at spinning fiction into fact, he's going to have a tough time convincing reasonably intelligent people that humans on Earth triggered a wave of global warming on Mars and Venus. Now there's an inconvenient truth. On February 28, 2007 National Geographic published an article with this heading: Mars melts Hints at Solar, Not Human Cause for Warming, Scientist Says. Kate Ravilious wrote: "Simultaneous warming on Earth and Mars suggests that our planet's recent climate changes have a naturaland not a human-inducedcause, according to one scientist's controversial theory." Sadly, Ravilious, whose assumption was "dead-on accurate" was forced to tread on ice instead of being able to come out say that the environmentalists had fabricated human-induced global warming in order for a select group of Watermelons to become billionaires by trading in carbon credits so the repentive whoremongering profiteers could erase their carbon footprints and begin restoring the planet to its pristine Edenic state. "Mars," she noted, "appears to be enjoying more mild and balmy temperatures". She sited the data above that was reported by the Pulkovo Astronomical Observatory in 2005 that I reported on in 2008. Ravilious reported that "...Abdussamatov believes the changes in the sun's heat output can account for almost all of the climate change we see on both planets." Let me be more precise. The changes in the sun's heat output was due precisely to Solar Cycle 24. Based on the data released by NASA over the last five years from the world's leading astrophysicists, the majority of the world's scientists (who are not paid by the environmental lobby or the oil companies that funded Al Gore's science fiction odyssey, An Inconvenient Truth) now dismiss, out of hand, that global warming is man-induced. In fact, science flatly rejects every theory advanced by ecowackos like Gore and conclusively proves that every warming and cooling phase on Earth is tied to solar fluctuations. In 2006, before Gore's Oscar, Nir Shaviv, an Israeli astrophysicist, denounced Gore's theories that global warming was man-made, saying: "Solar activity can explain a large part of 20th century global warming." Shaviv argued before the Intergovernmental Panel on Climate Change (then called the Intergovernmental Panel on Global Warming) that while "...the melting of the arctic ice sheets is indicative of global warming, there is absolutely no scientific evidence that proves CO2 and other greenhouse gases are the culprits that caused it...using computer models to find [ecological] fingerprints is hard..." because computer models are not based on facts but on suppositions of what previously happened, and what the author of the model thinks will happen in the future." In other words, the author of any computer model begins with a conclusion, and plugs in the data he requires to achieve that conclusion. The problem with beginning with a conclusion and not the evidence that makes up the puzzle is that any of the evidence to points to a different catalyst is ignored because it doesn't fit the conclusion. Shaviv admitted that "...a few years ago if you had asked me, I would have told you it was CO2. Why? Because its like everyone else in the public, I listen to what the media has to say..." and every day the media reports become increasingly apocalyptic. Yet, Shaviv admitted, "...there appears to be examples in our history when we had three times as much CO2 as we have today. There were periods when we had ten times as much CO2 as we have today. If CO2 has an affect on climate, then we should see it in the temperature reconstruction." According to Professor Ian Clark, Dept. of Earth Sciences at the University of Ottowa, "If we look at climate through the geological time frame, we would never suspect CO2 as a major climate driver"
Politicians no longer dare to express any doubts about global warning. Lord Lawson of the House of Lords noted on BBC that "...there is such intolerance of any dissenting voice. 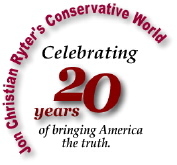 This is the most politically-incorrect thing possible, this climate change orthodoxy." The official National Oceanic & Atmospheric Administration [NOAA], NASA and the International Solar Energy Society [ISES] Solar Prediction Panel on Solar Cycle 24 was released on April 25, 2007. Solar activity is generally an 11-year cycle. Solar Cycle 23 began in 1994. About 80 years ago, astro-scientists discovered that the solar eruptions have an east-west orientation that reverse their magnetic polarity with each new cycle, creating what is, in reality, a 22-year cycle. When a new cycle begins, solar activity initially impacts temperatures a high latitudesat either the North or South pole. At midpoint in the 11 year cycle, usually at 5.5 years (although Solar Cycle 23 lasted 11.75 years), it will impact temperatures at the equator. The risk of 4 or 5 hurricanes are also at their greatest risks at that time. So, by the way, are the erratic cold-hot temperature swings that cause tornadoes. The Solar Prediction Panel postulated that 2012 would be a very bad year for hurricanes and tornadoes. The solar cycles drive warming and cooling conditions throughout our entire solar system. Solar eruptions are responsible for geomagnetic storms that temporarily cripple electronic communications on Earth and can potentially damage the power grids that provide electricity to the industrialized nations on Earth. We are now at the midpoint of Solar Cycle 24. As June arrives expect to see it beginning to play havoc in the Atlantic Ocean off the coast of Africa, bringing this year's hurricanes across the warm waters of the Atlantic to the even warmer waters of the Caribbean Sea and the Gulf of Mexico. But it appears the hurricane season will be a short one this year, according to estimates from the NOAA since they anticipate only about 90 solar flares this year compared to 140 last year. If that happens, the Solar Prediction Panel estimates Cycle 24 will wane in August. Solar Cycle 24 experienced the most extreme solar storms since record-keeping began about 400 years ago. Solar Cycle 24 peaked in 2010 with 160 sunspots. According to David Hathaway, a solar physicist if Cycle 24 plays out according to the sun's "solar flare historic memory" (which has been 94% accurate over the years), we can expect to see 2 or 3 category 5 hurricanes before Cycle 24 dies. The University Corporation for Atmospheric Research [UCAR] predicted in 2008 that Cycle 24 would be 30% to 50% stronger than Cycle 23 which gave birth to Hurricane Katrina. What all the global warming mumble-jumble comes down to is this: the 87% of the real astrophysicists and other real scientists (not the career political hacks with a degree) have never concealed from the 13% of the ecowackos with degrees who are designated as the government's top climate authorities (but who don't know which end of the telescope to look through), the reality that global warming and cooling is anything other than cyclic events caused by solar storms. The 13% political hacks have no interest in the views of the 87% since, in the minds of those in power, the "debate is settled" simply because the politicians backing the 13% have the power to enforce their will. Nothing flows through Congressincluding anything that resembles an annual budgetbecause the left, which still controls the US Senate, has no interest in negotiating with the Republican-controlled House and can shut it down simply by ignoring the bills it sends over. Why? Because it has to power to do whatever it wants. In 2009 the super-majority Democratically-controlled House enacted HR 2454, the American Clean Energy & Security Act of 2009 (to reward the participants in carbon trading). The bill, known as Waxman-Markey passed in the House with a "yea" vote from 211 Democrats and 8 Republicans. (Republicans voting in favor of the Cap & Trade legislation that would have made billionaires out of scores of Watermelons were Michael Castle [R-DE] [Defeated, 2010] , Mark Kirk [R-IL] [Defeated, 2010] , Leonard Lance [R-NJ], Frank LoBiondo [R-NJ], Mary Bono Mack [R-CA], John McHugh [R-NY] [Defeated, 2010] . Dave Reichert [R-WA], and Christopher Smith [R-NJ]). Voters need to keep in mind, that allowing your Congressman or Senator to vote for Cap & Trade signifies you don't mind paying from four to ten times as much for electrical power; and you don't mind having an electronic Smart Meter attached to your house that will actually be able to shut off any appliance in your home if the bureaucracy thinks you are using it too muchparticularly air conditioning in the summer and heat in the winter. (Depending on where you live, you may already have a Smart Meter attached to your home although, for the moment, they are being used like any traditional electric meter. Draconian monitoring of how you use your electricity will not begin until every home in the nation is hooked up, and a federal law enacted that will attach criminal penalties to those who try to bypass the meter. This is the reality of the myth called man-induced global warming. It doesn't exist. It never did. 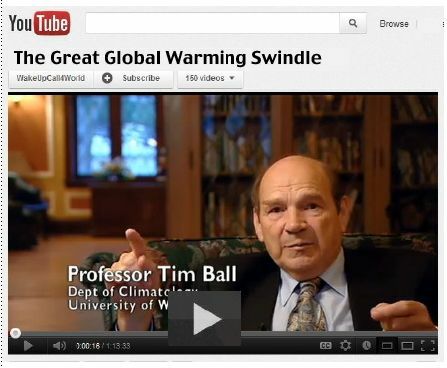 When Professor Tim Ball, from the Department of Climatology at the University of Winnipeg in Nova Scotia was asked if he believed in global warming, he replied: "I believe in global warming. I just don't believe human CO2 is causing that warming." The final authority on human-caused global warming, according to the media, is the IPCC (the Intergovernmental Panel on Climate Change), which declares it is the leading international body for the assessment of climate change. They are, in their opinion, the final word on global warming. Therefore, they are. Since thousands of scientists from all over the world contribute to the work of the IPCC, the IPCC claims they all agree with their view that global warming is mad-induced. As Christy noted, he belongs, and he disagrees. So does every intelligent man, woman and child who has stopped listening to the mainstream media selling a bill of goods to benefit the in the largest and most powerful industry. If you did not watch the video (above), do yourself an intellectual favor and click on the video and watch it now. If you believe that global warming is real at this minute, you will no longer believe in man-induced global warming when you finish watching the video. Get yourself a bag of microwave popcorn and enjoy the feature.